FEATURE Added 50 new wall sign items for casinos. UPDATE Lots of updates and streamlining to the new player tutorials. UPDATE Made the solitaire hint system more intelligent. UPDATE The phone and global chat buttons are now toggles (just a visual change). UPDATE The crew war participants list now colors the username to match the team color. FIX Moving a Crew Hall was broken in certain scenarios. FIX Various fixes to the mission system to resolve a number of different issues. FIX Scratchers weren't showing the awarded double XP on double XP day (it was awarding it correctly, just a visual issue). FIX In rare instances, some Party Bomb items wouldn't award the correct XP values to the one who dropped it. FIX Chat announcements that end with an emoji would sometimes break the delete button. FIX The editor button would sometimes vanish when going between floors. FIX Closed loophole that in certain cases allowed for crew war challenge scoring by bench players. FIX Prevent ineligible players from being selected in crew battles. FIX Prevent pigeon timer text from getting stuck on screen when a player goes in a building. FIX Citizenship subscriptions using PayPal would sometimes not automatically renew correctly. FIX Memory leak in private messages sometimes caused a browser crash. FIX Lots of bug fixes to the toolbar, especially surrounding private chat. FIX Various other error/bug fixes throughout the game. SUMMER PROMO: We have 6 new limited edition summer-themed items available for your casinos! Get the details on how you can get yours before they are gone for good after August 11 by clicking on the beach ball icon at the top of the game screen. HOT DOG EATING CONTEST: It wouldn't be summer without over-eating from the grill! Click on the hot dog icon next to the promo icon to see the progress and get details on how to participate in this community-wide hot dog eating contest. Participants that reach their goal and the community goal will receive a limited edition Hot Dog Eating Trophy item! FEATURE If you've played CasinoRPG on your phone, you know that the in-game phone has a "Games" app that lets you access any casino game more quickly. This feature has now been ported to all platforms! When selecting a game, you will be sent to a random casino and auto-walk to the machine/table (you can even do this from inside your condo or another casino). FEATURE For those that would like extra security on their account, there is now an option in the GoldFire settings (click your avatar on the toolbar) to enable Two-Factor Login. When enabled, logging in from a new browser/device will require a 6-digit code sent to your e-mail in order to finish logging in. This prevents someone from logging into your account even if they get your password. FEATURE A yellow shark display item has been added to the mix in the Auction House items. FEATURE A new super turbo poker tournament has been added called Super Sundays. UPDATE The kick list on a hosted poker table now gets cleared when the host leaves the table. UPDATE If you left-align the GoldFire toolbar, the notifications will now appear in the bottom left instead of bottom right. UPDATE If you aren't mutual friends with another player, they can no longer add you to a group chat. UPDATE Players that are away from a non-freeroll poker tournament for 10 minutes will now be removed (lowered from 15 minutes previously). FIX Various issues with missions that could cause them to not complete or get stuck. FIX Various fixes with new player tutorials. FIX Windows Store app updated to fix Casino Point purchase issues that several players had encountered. FIX Background music issues in Chrome and Safari. FIX Opening the global chat window correctly puts the focus in the input box. FIX A rounding issue caused large amounts of XP to appear incorrect. FIX Various client errors that were causing different random bugs that could cause freezing and other issues. FIX A few server errors that could cause issues when traveling around the map. FIX Clicking the back button after visiting a player profile from chat/forums works again. FIX Various other tweaks/issues with private chat and group chats. UPDATE Vastly improved the searching functionality for item names in the Auction House. FIX Timed missions would sometimes appear to reset progress before taking it back to the mission giver. FIX Disconnecting could sometimes cause a black screen in poker or other casino games. FIX Challenge and total scores would sometimes show incorrectly while keeping the scorecard open (visual issue, score was counted correctly). FIX Some poker hands weren't correctly counting towards battle challenge scores. FIX A few issues that could prevent crews from being matched for battle. FIX Various other bug fixes around crew wars, the lottery system, opting in to war, etc. FIX Voting for the top two crews in the war should now work again. FIX Phone apps could sometimes get stuck on the screen after trying to close them. FIX Casino addresses would sometimes show as "null" when taking a photo. 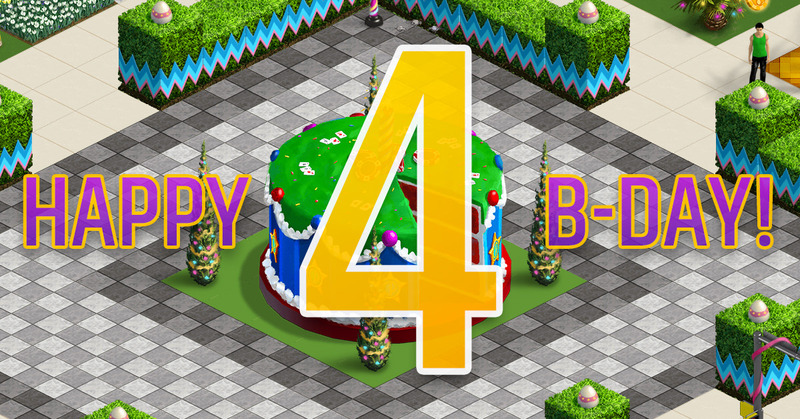 CasinoRPG left beta testing 4 years ago today! A lot has changed in that time. We are so thankful for everyone that has been along for that ride, whether you were here all the way back during beta or if you've just recently joined the game. All of us at GoldFire Studios have immensely enjoyed getting to know so many of you. All of your continued support is what drives us to continue developing great new features and updates, and we can't wait for you to see what we've got in store for the future of the game! EASTER PROMO: GoldFire City is fully decorated for the season and we have 6 exciting limited edition items! Get the details on how you can get yours before they are gone for good after April 15 by clicking on the egg icon at the top of the game screen. EASTER EGG HUNT: It wouldn't be Easter without a massive Easter Egg Hunt! Click on the basket icon next to the promo icon to see the progress and get details on how to participate in this community-wide contest. Participants that reach their goal and the community goal will receive a limited edition Egg Hunt 2018 Trophy item! UPDATE The crew info screen has been updated to show war stats for each crew. UPDATE Crews are no longer added to wars automatically (so no need to manage your crew finances to try and get into or avoid war). Instead, there will now be a 48-hour period after war is declared for crews to join the war. UPDATE Crew members no longer need to opt-out of war if they don't want to participate. Once the crew has joined the war, any member that wants to participate just goes to the battle tab on their crew window and joins their crew mates in the war. Only the players that specifically join the war are eligible for the team lottery (if one is needed). UPDATE Players that didn't opt-in to the war still get a scorecard to follow their crew's team progress. UPDATE The lottery for war teams will now run 24 hours in advance on the first day and 12 hours in advance on the others so you know well in advance if you are participating the next day. FIX The war lottery to select the teams only ran correctly for the first day. FIX Some crew founders got excluded from the war when they shouldn't have been. FIX Various issues with player selection for teams in crew battles. FIX Issue that could cause new battle challenges to auto-cancel. FIX In rare instances, a crew could get selected for two battles at the same time. FIX The team score wouldn't always update right away after completing a team challenge. FIX Short disconnects could sometimes cause a black screen in poker. FIX The GoldFire Settings display was blank for some players with an unverified e-mail.